Since the day her father’s fishing boat returned without him, Peri and her mother have mourned his loss. Her mother sinks into a deep depression and spends her days gazing out at the sea. Unable to control her anger and sadness any longer, Peri uses the small magic she knows to hex the sea. And suddenly into her drab life come the King’s sons-changelings with strange ties to the underwater kingdom-a young magician, and, finally, love. Patricia McKillip is one of my favourite authors and this book lived up to my expectations. It is written in her usual, beautiful style. She presents a captivating story about magic, anger and love. The story slowly unravels to reveal unexpected truths. It is a short novel which I actually really like about it. A lot of fantasy books seem to try and be as long as possible but this one is content with being its natural length, without adding things and diverging to try and make it longer. It is quite refreshing to read a short fantasy story. The characters are well drawn out and I found myself very connected to them. I wanted to know what would happen and how things would work out for the characters. The plot has a lot of substance for such a short book and you never really know what might happen next, making it a little bit of a mystery story. Although the novel is sometimes tinged with sadness it also ends on a positive note. This is very much up to the standard of the other books of hers I have read. I would recommend this to anyone who likes fantasy. It is an enchanting read. In Cassia’s society, Officials decide who people love. How many children they have. And that’s when her whole world begins to unravel . . .
I’m going to be honest and say this book disappointed me. It had such potential but failed to meet it on pretty much all accounts. Generally, I’m rarely disappointed by books and have never given a book below 3 stars before, until now of course. What really intrigued me about the book was the setting – it was such an interesting setting which rung a little like 1984. However, I didn’t really get a feel for the setting and there were lots of terms such as “Aberration” and “Infraction” which weren’t properly explained which left me feeling quite confused. As I read, I kept thinking ‘It’ll get better, just keep going, something exciting will happen!’. But to be honest – it didn’t. Not much really happened. The only thing that really kept me reading was the hope that something big was going to happen. There was only really one subplot and it wasn’t exactly gripping. It was just a very uneventful book. One of the worst things about it was how dull it was. I didn’t connect with the characters at all. There wasn’t really anything wrong with their characters themselves, I just felt they weren’t developed well at all and the romance fell flat. I felt no connection between Cassia and Ky at all. I never really felt for the characters. There was only really one scene which made me feel any emotion towards the characters and their situation. One thing I didn’t like was the narrative and Cassia’s inner thoughts – they seemed very unreal to me, she seemed to look way too in depth at everything in a way that is just completely unrealistic. Well, now for a little paragraph of things I did like. I loved the way Condie used the telling of the poetry and of Ky’s story and it made me sad every time she had to incinerate a part of something she had been given by these people she loved so. The relationship between Cassia and her family was very well written – I really believed that they cared for each other and Bram was written very well also. I found the concept of the blue, green and red pills very interesting and wanted to know what the red pill would do (and thankfully, unlike so much of the rest of the book, I was not disappointed but I won’t give any spoilers). There was one good thing about the silly love triangle that seems to be a necessity in Young Adult literature: the ‘love interests’ were normal, nice guys who were Cassia’s friends. So often at least one of the love interests is actually horrible or cocky or something. I could actually believe that Cassia would fall for Ky or Xander, unlike so many of the other ‘love interests’ in YA novels. I also quite liked the writing style, it’s just a shame the plot didn’t live up to its potential. Overall I felt this was a very average, bordering on dull, book. It didn’t keep my attention and the plot and romance fell very flat. I don’t know whether or not I’ll be reading the sequel, Crossed, but most likely I will not. A cold February morning . . . a snowy road . . . and suddenly all of Mia’s choices are gone. Except one. Gripping, heartrending and ultimately life-affirming, If I Stay will make you appreciate all that you have, all that you’ve lost – and all that might be. This book literally blew me away. When I spotted it on the shelf the main reason I decided to buy it was because I’d heard so much about it. I had high expectations for this book because I’d heard so much positive gushing about how amazing it is. I had my doubts, though. I wondered how a book set in such a short period of time would carry enough plot to keep my attention. But I really could not put this down. It only took me a couple of days to read (it would have been quicker if my schedule had allowed) because I was so caught up in the story. One of the best things about this book is the connection I felt with the main character. For some reason, I don’t even know how to explain why, I felt like I really, truly cared about Mia. And that’s something I often find lacking in books. I felt such an emotional attachment to Mia throughout the book, almost from the word go which isn’t exactly easy to achieve. All of the other characters are wonderful as well and their personalities are presented so excellently. Now, one thing some people might not like about this book is the massive number of flashbacks. I myself don’t particularly have anything against them, so long as they have a purpose and aren’t randomly thrown in to fill space. There are a lot of flashbacks in If I Stay but they aren’t boring at all and really help to connect with Mia as they help build a picture of her life before the accident. They help us get to know Mia so that we can sympathise with her more and understand how she is in the situation she is and who her friends and family are and the roles they have had in her life. A lot of the book was set in the hospital and there is a section where she is in the operating theatre. This is not described in detail, however, and I managed to read through it without any trouble and I don’t really like that sort of thing. Mia does also describe her families’ injuries at the scene of the accident which isn’t all that pleasant but it’s not too bad and is only a very, very small part of the book so don’t let that put you off. At times when I was reading this I couldn’t help but smile, and at others I thought my heart was going to break. And yes, I cried. Thankfully, though, I was curled up on my sofa at home and could weep to my heart’s content in peace. This is a really short review because there is genuinely nothing I would change about this book. I loved it to pieces and I can’t think of anything bad to say about it. I can’t recommend it highly enough but tissues may be required at various intervals throughout the book. To be honest I wasn’t sure what to expect from this book, but it wasn’t entirely what I had been expecting at all, if that makes any kind of sense. It was recommended to me by a friend and the opportunity arose for me to read it for my English Literature course so I dug out my copy to read. At first I found the writing style challenging – not difficult, but I didn’t find it an easy read. However the style was something I got used to and enjoyed. It does start rather slowly and I really was wondering where Orwell was going with it at first (hence only 4 stars) but after the first few ‘set up’ chapters I got much more into the book. I can see why those first chapters were included and think they are necessary to establish the setting of the novel – it would have been incredibly confusing without the background information set up in those chapters. As dystopia’s go this really is an excellent example. Before reading this the only dystopia I had read was teen fictions like The Hunger Games but I found reading 1984 so much more insightful into the genre and has greatly helped me with writing my own dystopia. If you’re planning on writing (or are writing) a dystopia then I really would advise reading 1984 as it has helped me massively. The world building of 1984 is one of its strongest points and really makes the whole setting incredibly believable – I actually believe that our society could turn into the one presented in this novel, something which isn’t necessarily that easy to achieve. It is obvious that a lot of thought and time has gone into each aspect of the world that Orwell presents. The novel is very thought provoking, especially the ending (which I won’t spoil). It really made me think about our society and what it could become and the impact of war on the world and different people. Overall, 1984 is thoroughly enjoyable and insightful, though you do have to plough through the first few chapters before the plot really gets started. I would recommend this read to anyone, but especially writers (of any genre, not just dystopia) as it is a really excellent example of how to write a great novel. However, this is definitely a novel not for younger teens or children, I think, as it is at times quite complex, both in its writing style and the concepts it presents. 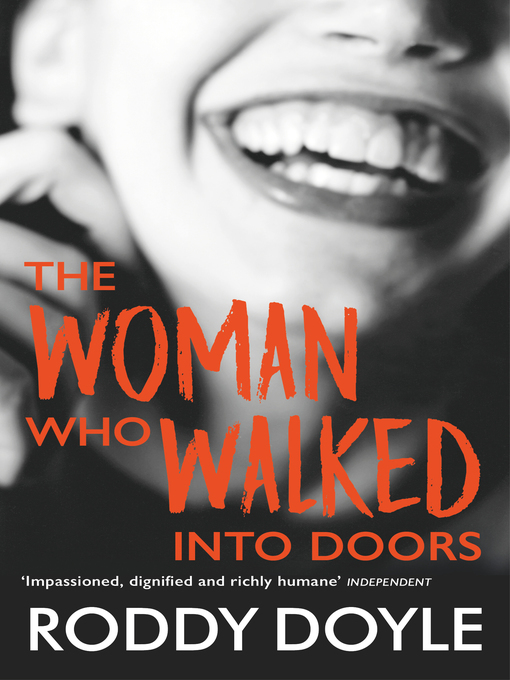 The Woman Who Walked Into Doors is a book that I was required to read for my English Literature course and at first I was sceptical. It takes time to get used to Doyle’s style and the jump in time is at first confusing but something that you barely notice after a few chapters. My experience of the book may be different to one reading the novel for enjoyment, as in class I looked in more detail than an average reader would. Through my reading, I saw a story that has great meaning, and a character which develops and a style that is unique and captivating. The peculiar title is very descriptive of the novel as a whole, and the realisation of its meaning only really comes in the latter chapters, but makes you think about the meaning even more so because of this. The fact that the novel was written by a man is truly stunning, as Doyle so convincingly tells Paula’s tale, as a woman’s perspective, despite having no inside knowledge of the workings of a woman’s mind. The style of writing itself truly reflects Paula, and the first person narrative allows the reader to really connect with her. At times you feel frustrated with her, other times you pity her, and other times you scrutinise and are disgusted by her behaviour and choices. The way Doyle writes the novel leads you into Paula’s story gently, gradually revealing more and more about her, until you really feel happy for her, and sad for her to. Reading this novel requires maturity on the part of the reader, and so I am glad that I did not study it in high school as there surely would have been immaturity. The ‘mature content’ is used sparingly but effectively and is not overwhelming, though at times makes you feel uncomfortable and shocked (as I believe was the intention of the author) as it gives you a greater sense of her unfortunate experiences (something that would be understood better if you read the book). However these moments are not described in mass detail and don’t take over from the rest of the book. The topics the book covers are approached by Doyle in a very effective manner. Domestic and sexual abuse and alcoholism are real issues and he presents them in a realistic way, and gives the reader a sense of what it is really like to experience these things. It may be hard for someone to associate with someone experiencing something they have never experienced themselves, but Doyle shows these topics in a way that is sensitive yet truthful. Reading this you may notice that I have not mentioned any bad points about the book, yet I have given it four out of five stars. I enjoyed reading the novel and acknowledge the wonderful and unique writing style that really makes the book what it is. However, I do not feel I can give it the full five stars, and I’m not sure how to explain why. For me, it doesn’t feel like five stars, but that does not mean it is not an amazing and recommendable read. There are many ups and downs and it is a very emotional novel at times (thankfully I managed not to cry while reading the novel in class but I may have been less restrained had I been reading at home). Rarely have I felt such a connection with a character, something Doyle has really achieved to the highest standard possible. So I would recommend you read this book as it truly is an inspiring read. Three angels are sent down to bring good to the world: Gabriel, the warrior; Ivy, the healer; and Bethany, a teenage girl who is the least experienced of the trio. But she is the most human, and when she is romantically drawn to a mortal boy, the angels fear she will not be strong enough to save anyone? especially herself? from the Dark Forces. Is love a great enough power against evil? I’m going to start with the bad, get that over and done with before I move onto the good. Adornetto often has a tendency to ‘warble on a bit’ and go far too in depth when describing the angels and how life if different for them on Earth etc. This makes the first couple of chapters quite boring and uneventful, not the best way to start a book. It also took a long time to get into the main plot and for the antagonist Jake Thorn to come into the story. Also, the idea of the zombie-like followers was a little undeveloped and was a little overdone and unimaginative. Now, onto the good! There are some really wonderful descriptions in this that paint a really vivid picture in my mind. Although it does take a while to get there, the main plot is very exciting, and continually makes me want to read more, especially in the last quarter or so of the book. Once you eventually reach the main plot it’s not that bad, though there are some serious cliche issues. The relationship between the characters is really good and develops well throughout the story. Xavier’s character is so loveable, you just can’t help but fall in love with him, however he does seem a little too perfect to be true. Bethany has a strong character and also Gabriel and Ivy’s characters are believable. Jake’s character is a little typical of an antagonist, he doesn’t stand out among all those other baddie characters out there. A good book, but not the best I have read. Though I will be buying the sequel.